Insect eating, or entomophagy to give it the proper name, has been widely viewed as the solution to increasing food insecurity. Its presence and prevalence has been growing. I think this shows a shift towards it being pushed into popular culture. Although, the fascination the West has with this may seem peculiar as insects already form a vital portion of diet for 2 billion people globally, where around 1,900 species are eaten. 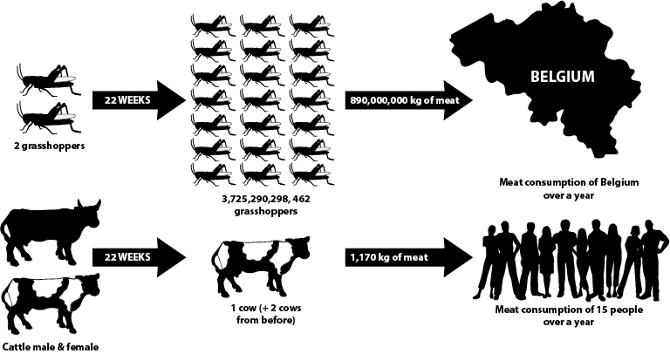 Currently the amount of resources used to rear livestock is bewildering, and arguably very unsustainable. It is widely stated that one third of crops grown globally are currently being fed to livestock, which when considering global food security issues is startling. This has led many leading scientists to claim a vegetarian diet is the solution to avoid mass shortages within the food supply chain. But maybe we don’t need to seek drastic diet altering solutions, instead we should seek changes within the production of our food to make the system more sustainable for the future. Insects could prove to be the solution for the ever-increasing problems facing the agricultural industry. Current shortcomings in our global food systems will only be exacerbated in the near future, due to climatic change as well as rapid population growth and consequent increasing demand for meat. The production of insects involves the use of far fewer resources, compared with the usual crops fed to livestock. Using insects as a source of feed instead of that traditional soy crop would result in an estimated 200-fold reduction in land use, which could prove to be invaluable. Further to this, insects have an overall significantly reduced environmental impact compared with livestock, as well as a much higher feed conversion rate. A growing population will result in an increasing demand for meat, which means creating a sustainable solution within the agricultural industry is even more vital when bearing these predictions in mind. I think the livelihood opportunities available associated with insect production will also prove to be valuable for many developing countries and consequently makes insects an even more attractive option looking to the future. As a relatively new concept, little is known about the costs associated with using insects as feed. I believe this could be a key factor in the hesitation to implement this method, as after all agriculture is a business seeking the largest possible profits. Furthermore, issues surrounding scalability can also be raised. Given the scale of the agriculture industry and the 1 billion tonnes of crop needed to sustain livestock, the equivalent number of insects needed to be produced would be a mammoth task. Additionally, one of the main arguments associated with using insects is that livestock consume one third of the globally produced crops. This assumes that without livestock consuming the crops, they will be distributed globally. However, this argument fails to account for the complex nature of factors associated in the global food production and distribution chain. Ethically, it would be unfair to feed insects to animals who would not encounter insects within their natural environment. Therefore, pigs and chickens, rather than cows, would be the livestock receiving the insect feed as a supplement to their existing diet. I also feel that should the wide scale production of insects occur, we should also be aware of the welfare of insects. Many do not consider insects to be animals, but I feel that is a dangerous stance to take and the same protection that occurs with livestock should also be applied to the future production of insects. Before we get carried away with the idea of using insects as feed for livestock, there are currently strict European Union laws preventing this practice, relating to concerns of feed safety and quality laws. Thank goodness for Brexit? Maybe not, these laws are important for public and agricultural health and implemented in response to mad cow disease, which was detrimental to the agriculture industry. The restrictions relate to banning the involvement of animals being fed to livestock as part of the food chain, this is particularly relevant when the insects are fed manure which results in a looped system. However, the European Food Safety Authority has carried out a study which has discovered that using insects as feed presents no higher risk than using grains. I feel that as Britain prepares to exit the European Union, whatever your own views might be towards this, we are in a unique constitutional position. The UK has the opportunity to pioneer and revolutionise our agriculture industry. Of course, this is a very idealistic approach and may not have any grounding in future political decision making. Realistically if this approach was effectively implemented we could save a lot of resources, especially crops. This would help to reduce food insecurity on a global scale, which will only become exacerbated in the future with the convergence of climate change and a growing global population. However, the implementation relies on a nexus of issues which I feel will hinder the progress of this revolutionary idea. Firstly, current EU laws restrict the use of using insects in food production because of health concerns relating to mad cow disease. With Brexit imminent, we will undoubtedly see government policies re-evaluated but I feel it is unlikely we will see a change in policy relating to using insects as feed without rigorous scientific research. Secondly, I feel that unless clear policy implementation and marketing is put in place then the ‘yuck factor’ will be particularly influential and create second rate meat which has been fed insects. Finally, human beings are strange creature who take comfort in safe behaviour. Being the first farmer to use insects, or the first consumer to eat the meat will involve an element of risk taking. Therefore, I believe for insects to become a mainstream alternative for feed, societal perception and attitudes need to be drastically altered and aware of the vast benefits it holds over grains such as soy. Previous Previous post: Food Waste – is it a problem?